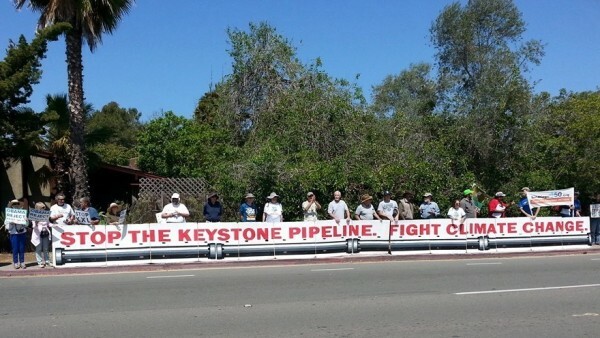 On Thursday, May 8, 2014, over 100 San Diegans gathered along Torrey Pines Road in La Jolla to call on President Obama, who was in the neighborhood for a fundraiser, to reject a permit for the Keystone XL Pipeline. The “KXL”, which would carry dirty tar sands oil from Canada to Texas for refining and export, has been called “game over” for the climate by the nation’s foremost climatologist, Dr. James Hansen. SanDiego350’s Emily Wier said that the KXL will greatly increase greenhouse gas emissions and worsen the impacts of climate change – including significant sea level rise, more extreme and frequent storms and wildfires, water shortages, and increases in heat and infectious disease-related health problems – while creating only a few dozen on-going jobs. Phil Petrie, a local artist in North Park, said that the country’s lack of response to devastating climate change is a moral issue. It will not create the jobs claimed* for it, nor will it reduce prices at the pump. In fact, prices may go up as domestic oil finds easier ways overseas. It threatens drinking water supplies. But most importantly, the IEA estimates that Keystone could harvest 3 times the carbon that would take us over 2 degrees C, the absolute limit for a catastrophe we might survive, if we’re lucky. And other carbon projects are in the wings, taking us up to +6 deg. C, with “massive climate change and irreparable damage” How reckless can we be? We are warned of this climate abyss by our most trusted messengers, such as NOAA, NASA, every scientific academy, such as the Royal Academy of UK (SIr Isaac Newton was president), the National Academy of Sciences (Einstein was a member), the very conservative World Bank, fact-checked by National Geographic, Scientific American. We are told of current disastrous health effects by the ?American Academy of Pediatrics, the World Health Organization and the AMA. We cannot rely on State Department assessments, if made by employees of the carbon industries. And Keystone could eventually strip forests the size of Florida, forests that might have absorbed enormous quantities of CO2 before they were removed as “overburden”. Would Keystone “replace” those forests? They’ve said they would make good any future? damage. Laughable. Even 2 degrees itself may be too high – a “prescription for disaster”?says Dr. James Hansen, chief climatologist at NASA (ret. ), one who, early on, predicted many of the catastrophic effects that we have seen. Shall we roll the dice for our kids and grand kids, saying “let it ride!” beyond 2 degrees and more? More, and we might invite abrupt, irreversible changes. No, taking your kids to to soccer practice or Disney World does not make up for that. With its high risks and low return, Keystone XL is not a smart gamble. Better is a price on carbon pollution that will boost sustainable energy (and hybrids) and a rebate check to citizens. . Or the DOD building 50GW of wind/solar, returning revenues to taxpayers. ?——*? *jobs http://www.ilr.cornell.edu/glo…?A recent State Dept. study said the construction workforce would be 5,000 to 6,000 workers. And once the construction phase ends, almost all of these jobs, however many are created, would go away. What can we do today and tomorrow to eliminate using any foreign oil? There isn’t enough interest in solar, and few people want electric cars. We continue to need crude and will for some time. There needs to be interim steps we can take to move away from foreign oil, not live in the fantasy that we can wake up tomorrow and everyone will be off the grid and driving a Volt. The oil companies think oil spills are good business, make money drilling for it and cleaning it up when you spill it. This project has to be stopped and the Tar Sands oil left in the ground. According to source on both sides of this debate, this is becoming the most expensive environmental battle ever. With the most people involved since the 80’s anti-nuke movement. TransCanadaCorp has had 10 fulltime lobbyists in DC since 2009 who have spent $4 million. The American Petroleum Institute reported $2.6 million in the last quarter of 2013 alone. This is just advertising money. The political contributions from the oil and gas industry were in the neighborhood of $80 million last election cycle 90% for Republicans. In Canada the Conservative Party is the same deal but money involved is about 1/100 of the US. Here’s a photo from Ottawa activists against the pipeline. .